It's great when you're entire family can enjoy in your passion. If you have kids and you've had enough of Laurie Berkner and the rest of the preschool favourites (although I do dig Laurie Berkner) maybe you should turn your kids in the direction of a great jazz compilation. Nicky The Jazz Cat is an excellent collection of jazz tunes that are perfect for day and nighttime listens. Unlike the plethora of classical sleepy time discs, Nicky The Jazz Cat comes with a great book that tells the story (in words and pictures) of Nicky as he meets the jazz legends (Gerry Mulligan, Lena Horn, Lionel Hampton and more) on his musical journey. The music and book flow incredibly well and its a great way to teach your kids about some of the legends of jazz. Nicky The Jazz Cat may not be immediate fan favourite for those you without kids, but those of you with kids looking for something to change the musical routine will be disappointed if you don't pick up this book and CD's. 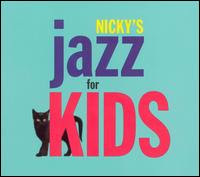 Surprisingly a lot of fun and educational for all (parents check it out: Nicky The Jazz Cat). Tune in Today at 11 a.m.